TuneIn Radio is one of the most popular radio apps. In fact, it is more than just that. You can listen to news broadcasts, podcasts, sports news, and audio-books. 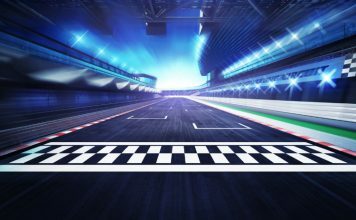 The news channels include CNN, MSNBC, and FOX News and the sports ones include MLB, NFL, and ESPN Radio among many others. You can browse through the massive catalog of the app, or search for something particular yourself. To top it all off, there is “Car Mode” that changes the interface of the app to a suitable one while driving. Lastly, if you want an ad-free experience and live sports feed, then you can subscribe to TuneIn Premium with an in-app purchase. 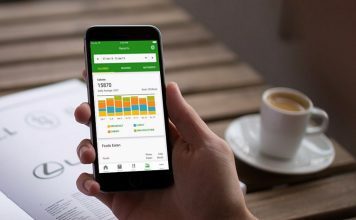 This subscription model is available for both monthly and annual payments with a free 7-day and 30-day trial respectively. iHeartRadio has a large music catalog for you to choose from. The first time you open the app, you are prompted to select the genres like rock, pop, and country that you like. Based on them, you’ll be suggested some radio stations best suited to your taste. 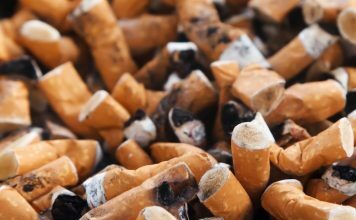 From these suggestions, you can choose to either save a station or discard it. You can even add local radio stations based on your location. 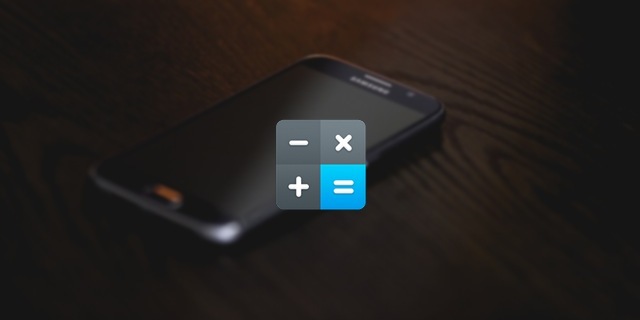 For this, you can either grant the app your location access or select a location manually. Selecting one manually can come in handy when you want to listen to radio stations which are not available at your location. There are more useful options available like selecting a mood like workout, chill, party, etc., sorting songs based on decades, and choosing from different genres like Country, R&B, Hip-Hop, etc. Furthermore, if you listen to some selected songs often, you can create different playlists and add those songs to them as well. 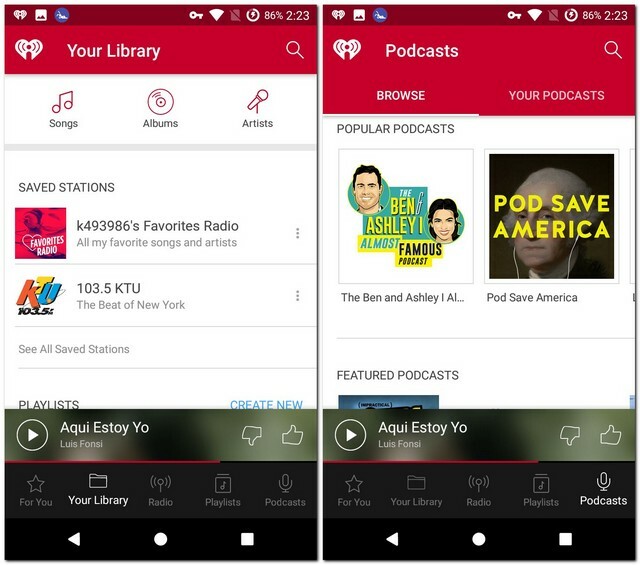 As an added bonus, iHeartRadio also offers podcasts. You can either browse for one, select one from the popular ones, or select one from topics like business, comedy, entertainment, etc. If you want to gain more control over the app, you can opt to buy either the “Plus” or the “All Access” version of the app that gives you additional features like unlimited skips, offline listening, and unlimited playlists depending on the version that you buy. The Plus version is available for $4.99/month and All Access for $9.99/month – both with in-app purchases. If you want to consider buying any of these, the app offers a free 30-day trial for both of these versions as well. Pandora is another popular radio app that works only in the US as of now. With it, you listen to only the songs you want to and nothing else. For this, you’ll have to create your own station first. You can do that by either searching for an artist, genre, or composer or by browsing through these categories. When you finally select one of these and play its radio, you can either thumbs up or thumbs down a song. This will help you see more of the songs that you’ll like on that station. There is a section in the app called “Feed”. Here, you can follow your friends, either by entering their email address or by connecting your Facebook account with the app, and then you’ll be able to see the stations they have created. This is a great way to find out which songs your friends are listening to. 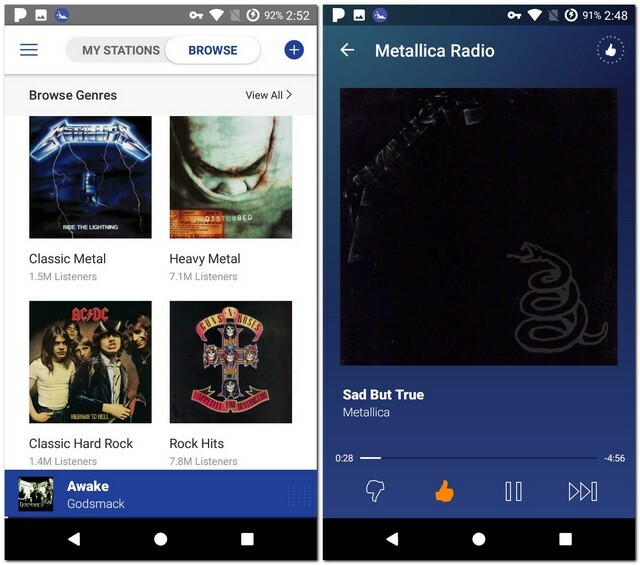 Lastly, if you want an ad-free experience with features like a higher quality audio and unlimited skips, you can subscribe to Pandora Premium for $9.99/month. And don’t worry about the price – you get the first 60 days free! 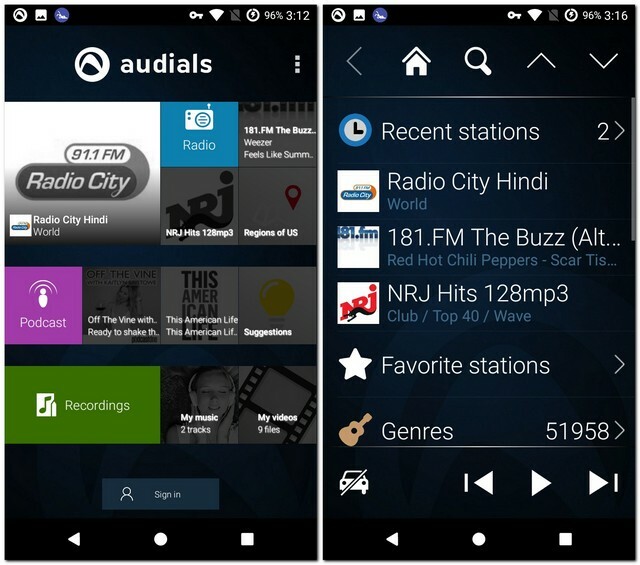 Audials is a radio app that has a simple interface but boasts many great features. For starters, you can browse through over 50,000 radio stations from all over the world. You can select radio stations sorted on the basis of genres, countries, top artists, and top hits. You can try many different stations, and if you like one, you can mark it as a favorite to come back to it later easily. Furthermore, you can even record any playing station and save the recording to your phone. In addition to this, Audials offers podcasts that you can listen to. You can choose them based on different categories like arts, business, comedy, etc. or browse one yourself. It has a built-in audio and video player that can be used to play corresponding files on your phone. Lastly, there is a “Car Mode” that changes the interface of the app to make it more convenient to use while driving. As the name suggests, Simple Radio is a simple radio app that offers radio stations from all over the globe. 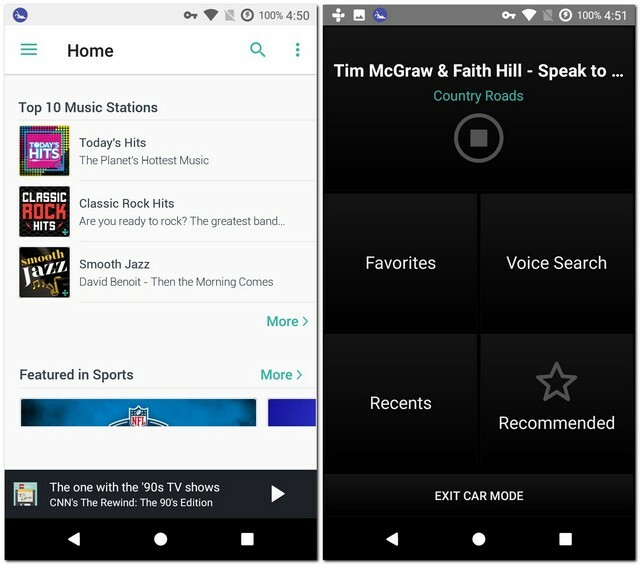 Though you see only two tabs – “Favorites” and “Recommended” – on the home screen of the app, you can search for any radio station in the search bar. 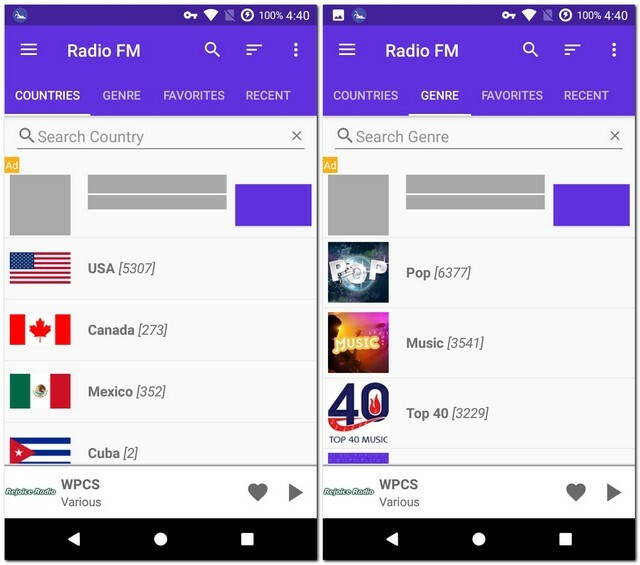 In case you don’t know the name of the particular radio station that you are looking for, you can search by typing the country name, city name, area code, or even the genre of the songs. 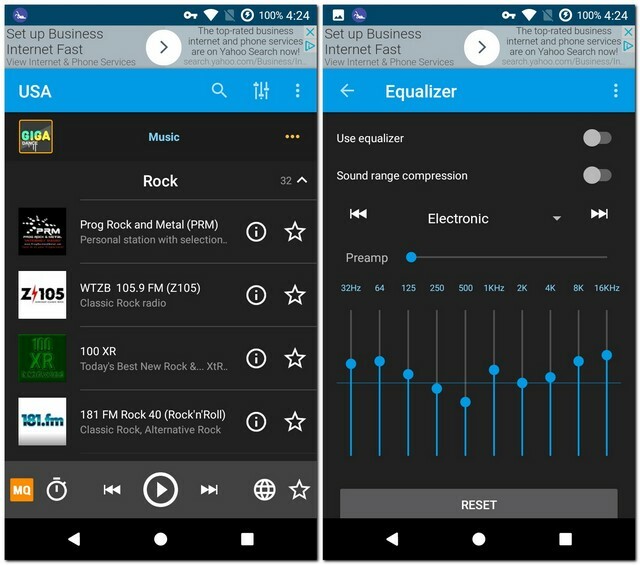 While it is a great app that offers many radio stations and doesn’t take up much space on your device, its strength is also its biggest downside. I’d recommend you to use this app only if you know what station you are looking for. If you want to explore new songs, then this app is not for you. XiiaLive has a colourful interface that, in itself, should be enough to keep you entertained. Regardless, you can browse through a big music catalog that has different genres like alternative, rock, classical, electronic, and hip-hop. Each of these genres have radio stations that you can choose from. If you like a station, you can mark it as a favorite to get back to it easily later in time. There are some additional features in the app like an equalizer and sleep timer that make it a great app. In addition to the music, you can also listen to different talks on a variety of topics like business, comedy, news, etc. Like the radio stations, you will find different podcast stations under each category as well. 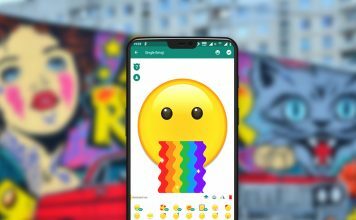 If the funky look of the app is not a deal-breaker for you, then you must definitely give this free app a try. When you first open the Dash Radio app, you are prompted to select some of your favorite genres. Though you can skip it at that point and select them later, I’d suggest you do that then to start using the app straight away. 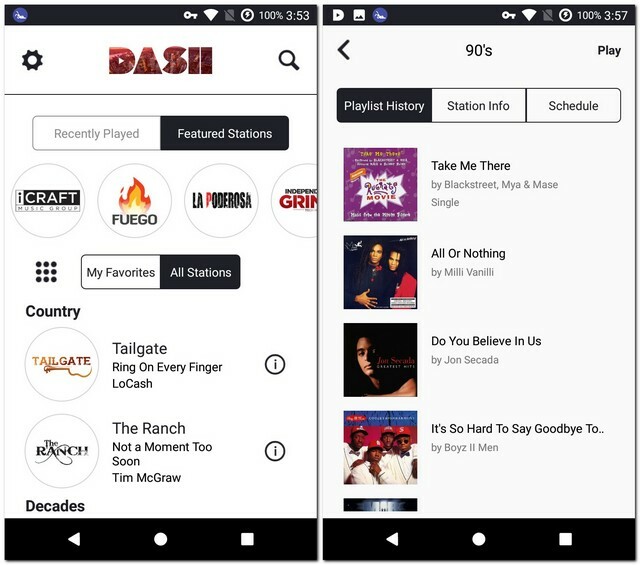 In the main screen of the app, you will find two tabs – one for your favorite stations and the other for all the stations. You can add as many stations to your favorites as you like. If you are looking for a particular station or a DJ, you can search accordingly in the app. And if you ever come across a station of which you haven’t heard before, you can view its playlist history and schedule to decide if you like station or not. As of the day of writing this, RadioDroid 2 has 13043 radio stations. How did I come up with that figure, you ask? 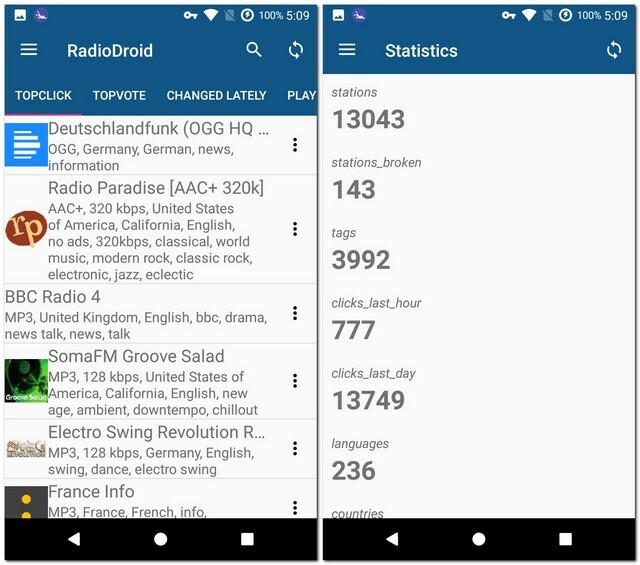 Well, RadioDroid 2 has a tab called “Statistics” that not only shows you the number of radio stations in the app but also the languages and countries those stations are in. Taking a similar route, the “Tags”, “Countries”, and “Languages” tabs show you the exact breakdown respectively. By default, the various stations are sorted on the basis of top clicks and top votes. You can search for more specifically too. When you play a station, you can view the data that gets transferred and can even record that station. Furthermore, you can set the playing song as an alarm tone as well. To make searching easier for you, each station has a few tags that can be used to find similar stations to the one you already like. On the main screen of the PCRadio app, the radio stations are already sorted on the basis of different genres like rock, pop, metal, etc. 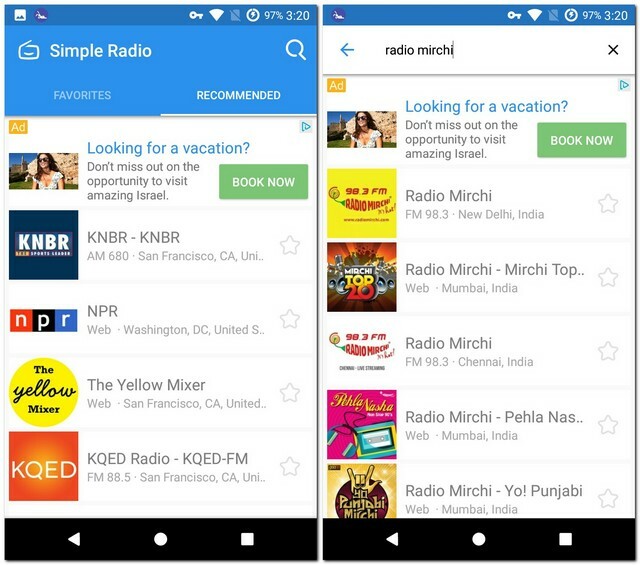 You can also search for particular radio stations in the search bar of the app. While the radio stations available are from different countries around the world, the default one is “All countries”. You can change this by tapping on the globe icon at the bottom-right of the screen. Like most other radio apps, PCRadio allows you to mark certain radio stations as a favorite to access them later easily. Lastly, the app comes with a built-in equalizer that you can use to modify the sound that you hear. Radio FM has a large music collection sorted on the basis of both countries and genres. You can listen to stations from any other country as well. To do that, you can either scroll down to that country or search for it in the search bar. The same thing can be done for different genres accordingly. These genres include pop, classic, electro, etc. For each station in the “Genre” tab, you can see the countries that station is available in and the bit rate that the songs play in. While playing a particular song, you can set a sleep timer that ranges from 5 minutes to 6 hours and can also set that song as an alarm tone. Needless to say, Radio FM also features the favorite station feature as well. 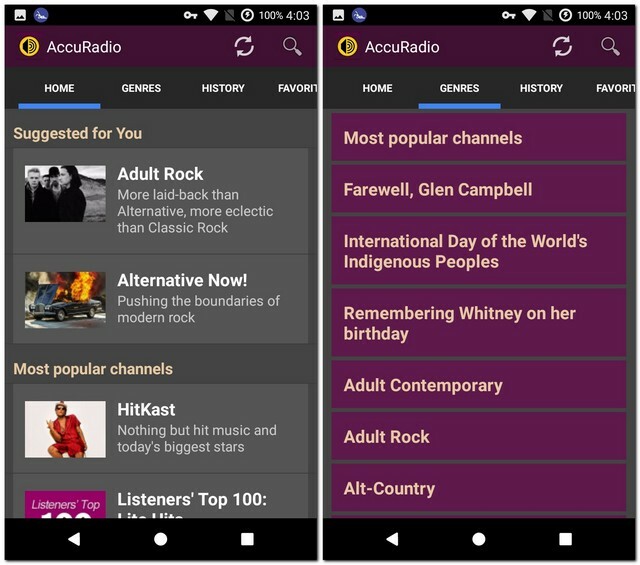 To use AccuRadio, you’ll be required to sign up on the app first. Once you do that, you can access tons of online radio stations available on the app. On the home screen, you’ll find some of the popular channels on the app. You can either browse through that list or search for a radio station yourself. The app also has the stations sorted according on their genres like rock, opera, jazz, etc. Similar to most other apps on this list, AccuRadio also allows you to mark stations as a favorite. In case you forget to mark one and come back looking for it, there is a “History” tab in the app where you can find the channel. 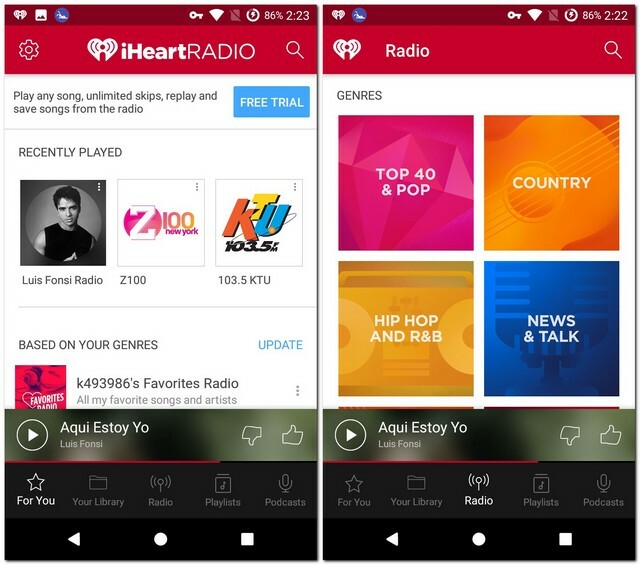 Now that you know some of the best radio apps that you can use on your Android device, you can enjoy music wherever you go. All you have to do is plug in your earphone and tune in to your favorite radio station. 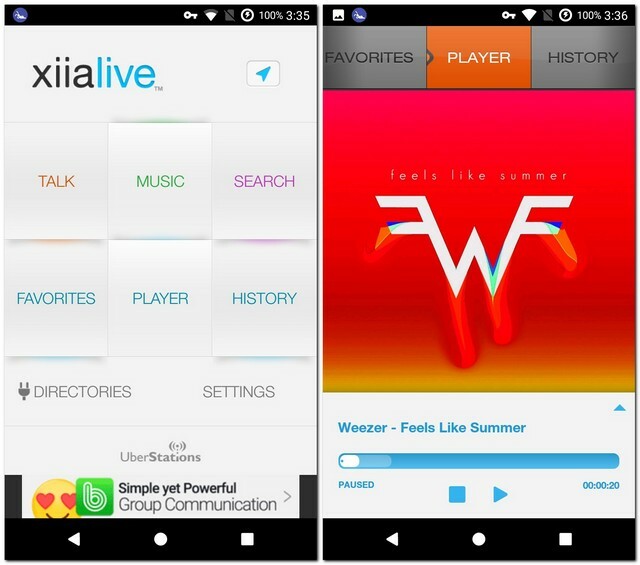 While some of the best apps are already included in this list, if there are some other good radio apps that you know of, I would love to hear from you in the comments section below.